"Men make up 83 percent of Google’s engineering employees and 79 percent of its managers. Of its 36 executives and top-ranking managers, just three are women." Oh, and black and Hispanic people are also underrepresented. This is a very serious problem for all mankind because research has shown that the most effective and creative work groups are heterogeneous. You don't have to be a rocket scientist to surmise that something important is not being developed, not being created, not being invented. Google is undertaking a long-term effort to improve these numbers, "the centerpiece of which is a series of workshops aimed at making [their] culture more accepting of diversity." Google, that's not going to work. 1. Tiger and helicopter moms - take your daughters to coding classes instead of ballet. Everyone in the 21st century is going to need to understand coding. The odds are overwhelming that just like your son is not going to play in the NFL, your daughter is not going to be center stage at the American Ballet Theater. 2. In middle school, girls who are interested in the sciences tend to move away from them. A multiplicity of factors are responsible for this happening. Schools need to actively develop programs that encourage girls to participate. 3. 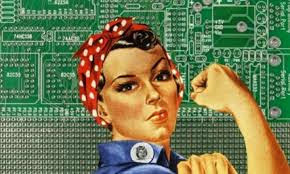 Tech companies need to create, and promote paid summer internship programs for high school girls and college age women. 4. Tech companies need to create and promote management training programs for women at the beginning stages of their careers. THAT is what is going to work. Oh, and girls, if you want to run the world, make lots of money and pay for your ballet tickets, you know what you need to do.